we had a good nights sleep but got up a bit the worse for wear. Mark put the kettle on in the back of the car while I got a shower. Nick and I looked at options to stay for tonight, we were hoping for something north of the melow bridge. We struck lucky apgain, a quad room and a twin in a town who’s name I can’t .remember, between Saint Poncy and clement froid. The down side was it was 902 Kim’s away, that will be the biggest driving day so far. Although when converted into miles is only 540 , but all motorway. By around 11:30 we had done 250 km and stopped for breakfast. Omelette but no more fancy eggs from back home, Spanish supermarket variants. Not as good, but filled a gap. We came to the end of the paeage and my card wouldn’t work. Had to use marks, cause for concern. Driving so far today is only a means to an end, we have one item that will punctuate the day, the merlo bridge in France. The highest decked suspension bridge in the world designed by Norman Foster, a British architect. The bridge did not let us down, graceful and elegant, astonishingly high and a most impressive construction. Well worth a trip. Traveling north you go over the bridge before you come to the visitor center, we pulled in to investigate and view the bridge . You can see the town of millau below the to the east of the bridg and then up towards the deck of the bridge, it seems impossibly high, driving over the bridge gives a real sense of height, and would be challenging to any on with any felling of vertigo. They have built wind deflectors along the sides of the bridge made out of plexi glass. So are largely invisible, the columns are higher than the eifle tower. We took some photos then I want for a look on the visitor center. They have a brilliant video running about the construction and conception of the bridge and lots of pictures and plans to review. Also they had three or four of the scale models used as design concepts. Five star for the millau bridge and visitor center, by far the best engineering theme destination of the trip, in fact the only one. soon after the bridge came to tol booth and wating for us on the other side was a group of Duane French customs police, we were all taken to one side an all three cars were searched, it appears they had some inside infor on us, perhaps from CCTV cameras on the motorway. They were all friendly and professional, I got the impression the girl who searched my car was not happy with its general condition, I was glad she did not look in the glove box, the mint flower from morocco we were given in guelmin were in there and look and smell suspiciously like weed. The hotel was off the beaten track but it was a fairly run down place with lots of potential, the French May call it shabby shiek, I call it tatty.the husband and wife team were very nice and made us dinner of salad and omelette for me with chocolate blamange for pudding, it was ok, it was washed down with a couple of bottles of local wine which was good. Given Andy had avoided sleeping in the same room, I was left to judge the snoring completion, by morning there was a clear winner, and a clear looser. This was a long day good scenery up into the mountains in Spain, but not so good as to offset the time we spend in the saddle. We set about catching up with the set of the team who were by now at least 60 km in front. Not quite clear if we went the wrong way, but I don’t think we did the same route as them. There was a constant balancing act with dring fast and keeping the engin cool. It has been the story of this road trip. We never did catch them up and arrived in a small Spanish town of Piug to find them sat at a bar outside the hotel. After unloading, we joined them, I guess we got back to the hotel at around midnight, nick and I having done our best to boost the local Spanish economy. Hotel borja was probably the best of the cheep and cheerful we have stayed in, triple room with nice functional bathroom and reasonable beds. I think it was around 60 euros for the six of us, no breakfast . As I write this, we are on the ferry back to Europe, home of great countries like wales and a few others. We have put the minor risk of kidnapping behind us and can now deliver up to date blogs. Although I liked spending time in marakesh with Elaine, and not having to drive for a couple of days, it’s not the sort of place to rush back to and I was looking forward to the challenge of getting the old girl home, my astra that is, not Elaine. After what seemed and age to sort out the bill we all went to the car park and loaded up. With in a few minutes, we had said outer good byes and were a on our way to Europe. The traffic was as expected, manic. Constantly being cut up and having to jostle for position against a swarm of mopeds. We made good progress then when comming into a roundabout, a large four by four decided to egnor my presence on the road and drove into the side of me while changing lanes. I guess in hind sight, I should have beeped my horn, but I didn’t and we crashed, we were only doing around 30mph at the time but it had a significant effect on my front drivers side wind! and non what so ever on the relatively new Nissan. We both pulled over after the roundabout, I was unsure of the protocol for accidents, but not having looked at my car and going straightt over to his, I was not to concerned. The driver was a fairly well educated black guy with a very pleasant nature, we both looked around his car, it was clear he was in the wrong and his body language told me he knew he was. No major damage to his car, we shook hands and I gave him one of the cards with our web site on and we moved on. He was a nice guy and I didn’t want to give him hastle, it was a simple ace dent and no damage done. Further up the motorway, Jim asked if all was well and how bad the damage to my car was, “Jim” I said, I don’t know because I haven’t looked. Jim said the front wind was a bit beaten up. On the next roundabout, I could hear the front wheel rubbing against the fender, Doh, better check that some time! The main rout north is paeage that cost in total around 150DM from marakech to Ceuta a good road! fairly flat and quite fast. Motorways are not like the uk. People gather grass for their donkeys in the central reservation, cops stand in the central reservation with speed cameras, farmers constantly looking to cross the road on foot to tend there flocks, a bit dangerous. There is a lot of danger in this country, yesterday in marakech, we saw into a workshop where Tiber was being processed, there was no safety gaurds on the machines and the operators were not wearing any protective clothing. I tried to suggest the PPE stations could be used on the shop floor where people could collect ear and ey protection and gloves etc, similar to those made by the Colour red! one of or sponsors who provide a briliant service to industry UK wide. I think my suggestions would be ignored. We had lunch at around 3pm, usuall noodles and veg, very nice too. I would like to take this opertunity to thank nick for his assistance with the cooking on this trip and for all the help the rest of the team have given in eating the food and helping with the washing up! I found the sticky on flags I had bought for Morocco and Western Sahara and stuck them on my now bent front wing, I had to move the one for Rhodes and Kimberly, who provide and excellent service as pattern makers for lots of major manufacturers around the West Midlands and the uk. I have been dealing with Rhodes and Kimberley now for a couple of years, and I think they are a really good company, friendly knowledgable and very helpful. A good lie in was a welcome change from the ususall early rise. After breakfast, we went out into the market again. It was interesting but I think I had seen enough of this so after a while we went for some lunch then back to base. After a while we decided to find a place for tea, and found a really nice restaurant with the best food so far in the city. Although we were tired, we enjoyed our meal then went back into town to buy a few bits to take home. It started to rain, then it became torrential rain with a spectacular lightening display. We got soaked. Back at base, a couple of tins of Slag lager and off to bed. We had a good nights sleep, or at least I did, my snoring kept Elaine awake and after a breakfast of bread, cake, pancakes, jam and honey we set off to explore. I didn’t know much about marakech before we got there and now having left after two full days there, I don’t know much more. Similar in many ways to Istanbul, busy, noisy and largely good value, it seems to have quiet days and busy nights. The traders around the main square are pushey but easy to deflect if needed, and the bartering can be fun, but be realistic about your expectations. Probably best to have an idea what you want to pay then start talking a bit below it. Only move up to your price when the vendor is about to walk away. They may try and give you the impression that they have started at a low price, but there is always room for improvement. There is a significant amount of fake goods on offer, don’t be mistaken into believing they are the genuine article, they are not. Sports wear is the main item on offer and watches. Buyer beware. Some of the locally crafted items are very good value, but check the quality, and remember you have to get them home. One of our team has bought a lot of items and I guess they will be going home in one of the cars! In the main square, it is very busy and can be a bit oppressive, traders constantly want you to buy things, usually tacky tourist rubbish, and lots of noise form the snake charmers and other musicians. There are people with monkeys. This doesn’t sit comfortably with me and I don’t think it would go on back home. The snake charmers have several snakes, I am no snake expert but I don’t suppose the snakes are very happy. Also note, if you pay some one to take a photo, ie a snake charmer, they will always ask for more, don’t give them more, look at how much the service has cost them and pay them a fair price. I gave a snake charmer 10 dirhams to take a photo , i was only there a few seconds, he wanted more, that would work out at a very high hourly rate, I politely declined at first then told him in industrial language to go away. He got the message. Food is ok here, but I am not that impressed from a vegy point of view. It doesn’t seem that tasty, given they traditionally trade spices, they seem pretty reluctant to use them. Although we had explained our early strategy and not needed breakfast, it was ready anyway soon after we woke, yoghurt, tea, bread, honey and jam. Very simple but good, probably all made locally, a perfect start to the last day before our rest days. 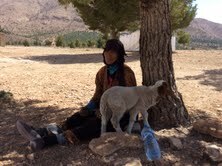 We said our goodbyes and got on the road again, next stop marakech. The first part of the journey was the most difficult of the trip so far, after negotiating the police in Guelmim we set off up the motorway, and it was up, we climbed around 600 m in the first five miles, it was torture for the old car, we could not keep her cool and in the end left the rest of the team to carry on and aimed to catch up on the other side, it seemed to go on and on, I was dreading blowing a head gasket or even a hose. Eventually we made it to the top and a rest for the car on the way down, we had passed dozens of cars on the hard shoulder suffering with the same problem. 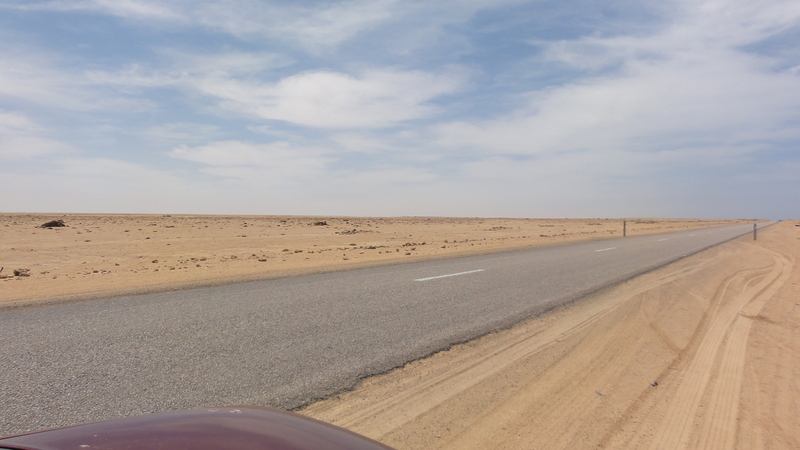 Once over the mountain, the road to Marrakech was relatively flat and the drive in was quite exciting. As we neared the city it got more and more busy . I write this note after leaving Marrakech for home and memories are starting to fade already. We have had such an adventure, the events are so frequent that it’s difficult to keep them all in mind. 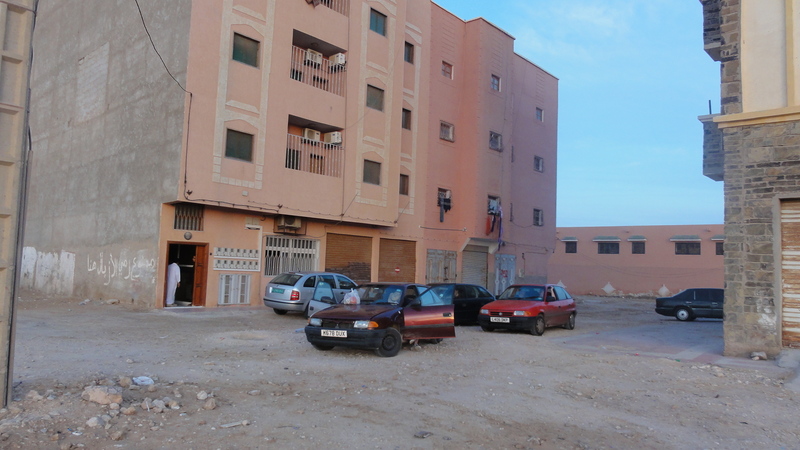 Nick had booked somewhere for us to stay in Guelmim for the next night but had not told us the nature of the venue, we drove off in eager anticipation of another interesting place. On the way we stopped a few times for fuel and food as is the norm, fuel costs between 7 and 9 DM per litre, that translates to .7 to .9 euros, about half the price of home. Diesel is always available but petrol not always, and the chances of using cards is infrequent south of Agadir. My car is doing around 52 mpg. We had a rubbish attendant at the fuel stop, he kept filling the tank even though it was already full, emptying about a litre of diesel on the floor at both my fill up and Jim’s. What a dork. We stopped for breakfast and had another tasty omelette, this time with eggs from the farm where Elaine works, tip top, we were happy campers and ready to hit the road again. It was getting towards dark when we arrived in Guelmim, we were all thinking that we would be in another hostel or cheap hotel in the town, Nick took us about 10km up into the hills to this most picturesque small hamlet of houses. We wound our way past a few houses in the fading light and came across an old man in traditional costume, guiding us to his house. It was just as I remember houses from a book of stories from the bible I used to read at Sunday school, we could hardly wait to go inside. The front door opens onto a courtyard that has rooms off around three sides and a gap at one end with a large open fronted tent with carpets on the floor near the front door and to the right, beyond this were some steps up to the roof that was set out with tables and chairs and spectacular views all around. Our rooms were basic but delightful, twin beds in each and a shower room across the courtyard. Each room had a small window facing the courtyard. I could hardly wait to go to bed. We asked our host if we could have something to eat and Nick explained that I was vegetarian. We all sat on the roof and watched the sun go down, I think this is the most beautiful place I have ever stayed. Dinner consisted of dromedary and vegetables with rice cooked in possibly yoghurt. That was for all or us, I explained that I was a veg and was told, so are dromedaries! Clearly we had not got the message across. The host sorted me a salad that was very good. One of the lads later complained he had a bit of dromedary stuck between his teeth, on reflection, I don’t suppose I will hear that statement again! After the main course we had fresh oranges and cinnamon for pudding and tea. The tea was an art in itself, involving a ritual to make it that took some time. It was delicious. The tea appeard to have a small amount of canabis resin dissolved in it, it was not strong but certainly had an effect, we were all laughing ad joking after the meal. Although it was a fairly clear night, there was a level of light pollution from a couple of street lights in the community. I went for a short drive out with the man to get away from the lights but the sky was not really clear enough to give a good view. I had really wanted to see the stars while I was away, but this will have to wait for another visit. Sorry Tom, we didn’t seem to get round to calibrating your birthday. happy 23rd birthday from team astra. I slept like a log, I was looking forward to seeing Elaine in Marrakech the next day and not having to drive for a couple of days. The big day at last, we all got up with clear heads and were on the road for 7:30. The digs had been good and the staff friendly, it would have helped if water had actually come out of the shower, but other than that we have no reasons to complain. Mark had had the foresight to make a flask of coffe for us to drink on the road, this was going to be a long day. Once out of Laayoune, there was very little in the way of towns and villages, we drove for over one hundred miles and saw nothing, no fuel station, no houses, only donkeys, camels and cops, the cops are everywhere, we were stopped five times yesterday and at the time of writing we had been stopped nine times today, it got very tiresome but we haven’t been fined today and they are friendly enough. car boiled up as usuall going up the hills but we contained it with a selection of the techniques Described earlier. Once through the hills, we knew it was a matter of just driving as fast as we could to get the miles in. The roads are rough but very fast as they are largely straight, I haven’t measured but I am sure some of the straights are At least 15 miles long. We pulled in at bojadour for refreshment. We had a really good cheese (Haloumi) omelette made from James eggs of montgomery. Probably the best eggs in the world. We really enjoyed it, all washed down with a cup of coffee, the coffee having been sourced in The spar in montgomery before we left. Fortified, we set off with 300kms to go(about) we were all buzzing with excitement and looking forward to reaching our goal. We were stopped by the police 9 times on the way down and asked to produce our licences, it held us up a lot. Once we had passed the turning for Daklah we set the sat nav to show co-ordinate so we could count down the distance more accurately. 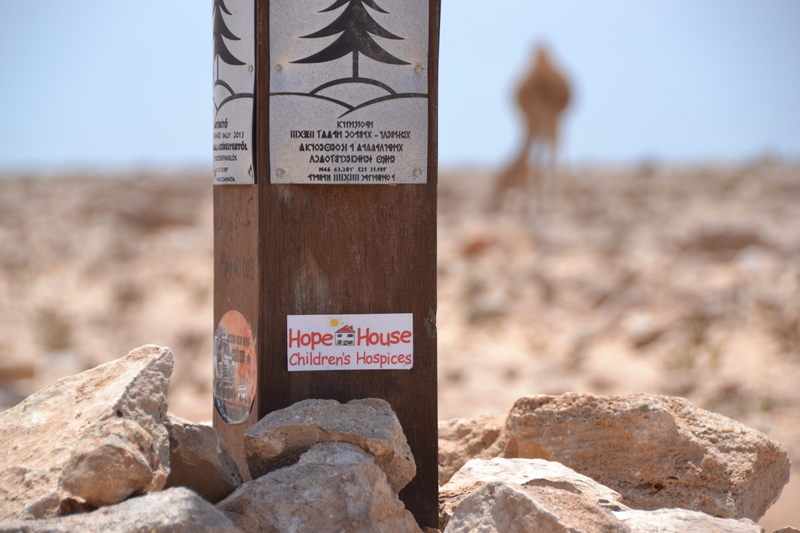 The Northern Tropic lies on the 23° 26′ 14.675″ parallel, we had to pass this position but were fairly confident that there would be some form of marker. As we got near I felt quite elated, me and my car had initiated this trip and from that, six people had driven to the northern tropic and we had had a ball. 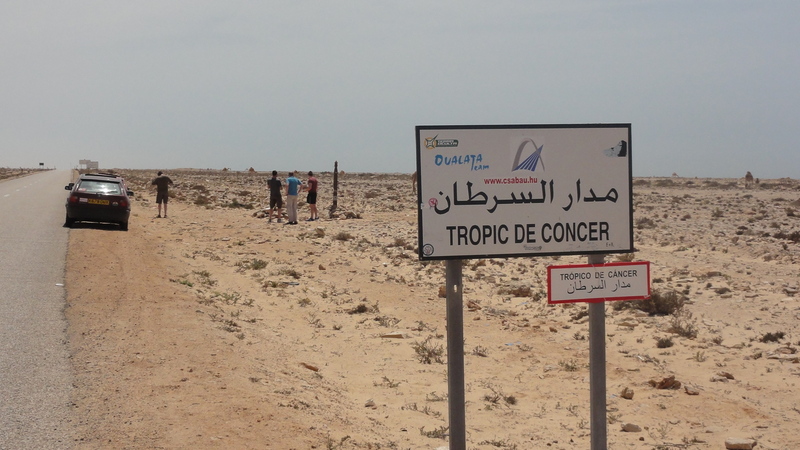 It was a great feeling to get there, we all shook hands and took loads of photos before moving on to Dakhla , and hopefully a nice hotel with a pool, a good pool like Colley construction of marton might build! Professionally installed and helpful support with maintenance etcetera. Left the arms of mediocrity at around 7:20 to head South, the hotel was a long way inside the the town so we were some time before we got back into the desert. Although we have a lot of miles to do again today, by one o’clock, both mine and Jim’s cars had been stopped by the police, they were friendly, just checking what we were up to. The thing to notice about the Moroccan police is that to save money on lots of different uniform sizes, the have a one size fits all policy, I think they have chosen large as the standard. We have not yet spotted a single copper in a uniform that fits. While I was writing this bit of the blog we were pulled over again, this time all of us and they wanted to see all the paperwork we had. One of them was a bit keen on our cameras and kept trying them out, they did not seem to take their jobs very seriously . We didn’t take them very seriously in their oversize uniforms either. We were stopped a further three times by what turned out to be gendarmes, the last one of the day was just after the gendarmes had pulled us over . It turns out there are two different types of police, the second type are the nasty police. We ran a check point because we didn’t know they wanted us to stop being as we had just been stopped with in 100 meters, they called us back and. Me and mark went back. Jim and Tom later joined us, they said we had committed and offence and wanted 70 euros as a fine, we argued the case with them and me and Jim were taken into a hut to speak to the chief of police. The hut was full of flies and one copper at a desk. He didn’t speak English and muttered to his mates in foreign . The short one kept saying 70 euro 70 euro and got a bit irritating. He was on a power trip and had bills to pay. 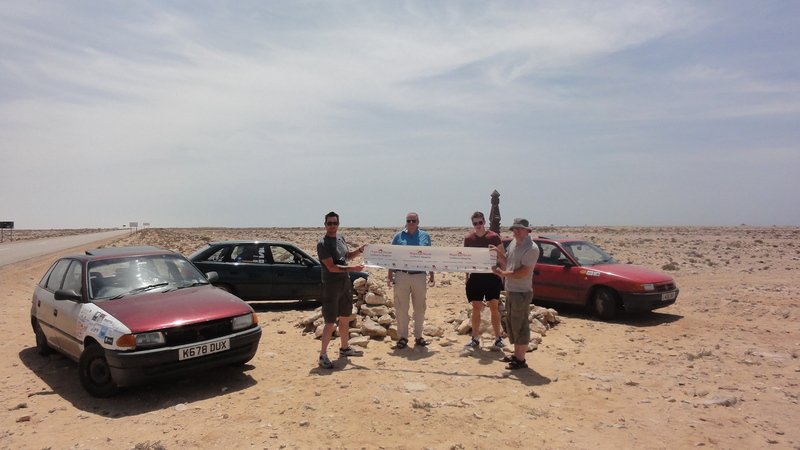 Eventually they settled for 200 Moroocan dirhams about 20euro. And then agreed to give us our pass ports back. No receipts or paper work was given for the fine, I guess the police Christmas ball this year will be extra special. We left feeling very bitter towards the police and the country as a whole. There are few things worse than a bent copper, I am going to pen a letter to the Moroccan consulate in London and give them a piece of my mind. 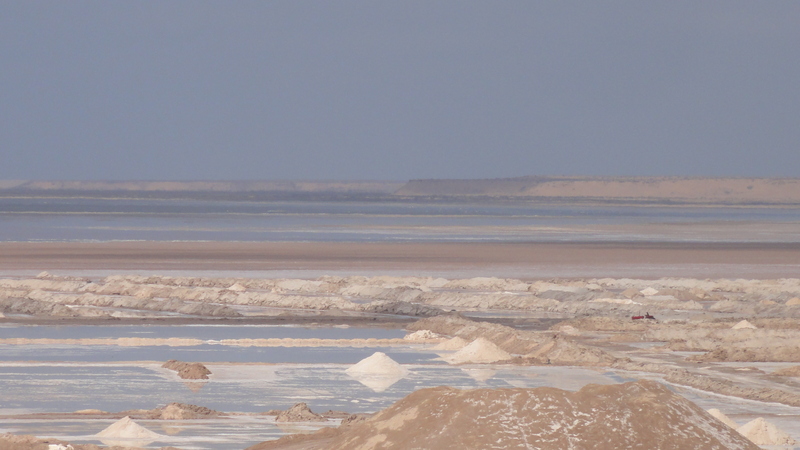 On the road south we spotted a place where salt is collected from the sea as it evaporated in the shallow beaches, it was a really unusual site, we pulled over and went for a walk to get a better view, there were dozens of cones of salt by the beach and a small shed that must have served as a processing area. The pictures should clarify this, as it turns out, it was well worth stopping, but it could have been different. On my way back to the car I collected a few stones and took photos of the flora and fauna. We got back in the cars and drove one, we drove on less that 200 meters and on the side of the road we had wandered off onto was a big sign in several languages ‘DANGER LAND MINES’ we counted our legs then counted our lucky stars, all was well, I make a point of never wandering through mine fields. Don’t suppose they get many objections to wind farms, there is nothing else out here and no one to complain . This was like many parts of the country, under development. There were cranes and workers putting them together as we drove past. It’s an ideal location, plenty of wind and very little other opportunity for power generation, but it begs the question why not solar? We saw some, no elephants yet though, I thought Africa was full of elephants! We relied on sat nav to get us to the hotel for the night, when that packed up we only had GPS co-ordinate a to find it. If you had been parachuted into the area from the UK it would be a very uncomfortable place. An area of large tenament blocks built in the seventies and now in a state of disrepair, no made up roads and litter everywhere. The hotel was one of the blocks, as shabby as the rest and not what you would call a prime location. There were some ladies preparing for a wedding in a lock up under the hotel, they seemed to know we were comming and waved us towards a place to park and the hotel man came out to greet us. Everyone was very friendly and welcomed us in, the building was large and very spacious we had two suites , one with two bedrooms and one with one, each had a large living room with sofa beds and a large kitchen and bathroom.. There is acces to the roof and one had a small balcony. For £60 for six of us, no not £60 each, £60 for all of us, you can’t complain, well most of us can’t, Andy on the other hand saw hygiene issues everywhere. Nick and I went in search of a super market for bread and water. The shops are in a different league to the ones at home, sparse and basic, but not short of stock and with friendly staff. We are the only white people around, it felt a bit odd, but not threatening. We got the goods and headed back. No beer tonight, When we got back back the other two cars were in garages under the hotel and we put nicks in to join them, no security issues here.